Registration: Space is limited; advance registration required. You will receive additional information once you register. 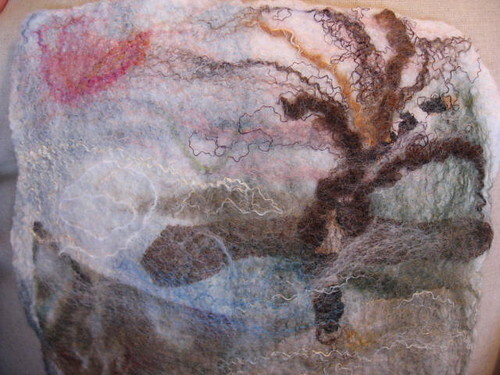 Wet felting is a magical and hands-on fiber art process. We'll lay out soft, fluffy wool fibers in layers to create a composition and then apply soap and water and pressure from our hands to transform them into stunning 2D form. Wet felting is an excellent medium for exploring texture, color and freeform design. This class will begin with an outdoor stroll with naturalist Naomi Cobb to observe the subtle colors and textures of the winter landscape at Lynden. Back in the studio, we'll combine silk with wool fibers to create a 10-inch-square winterscape. No experience required. Dress appropriately for outdoor walking. We have aprons, but please wear clothes suitable for artmaking. Jane Moore is a lifelong fiber artist. In 2004 she discovered the beauty and mystery of the wet felting process, and has passionately pursued felting in her own 2-D and 3-D work. Moore's work has been featured in many galleries in the Milwaukee area. She is an active teacher in the community and has taught wet felting to students of all ages and abilities.